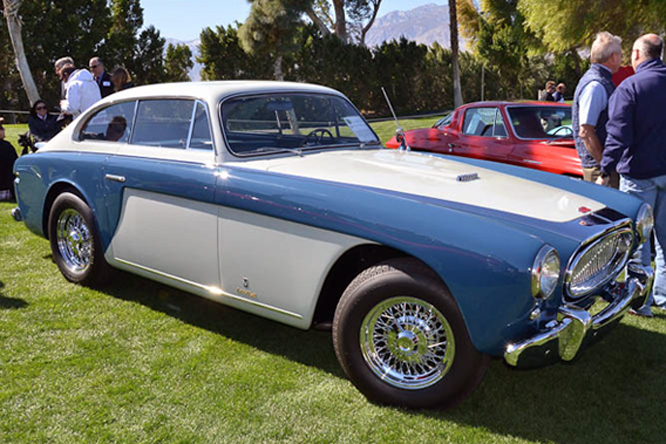 After experiencing less than outright success at Le Mans with the Cadillac Le Monstre Cunningham in 1950, Chrysler powered Cunningham C2R in 1951, similarly powered C4R in 1952 and C5R in 1953 Briggs Cunningham decided that three short comings of the previous designs had to be addressed. His next new project the C6R, had to be smaller, lighter and right hand drive to optimise weight distribution on a circuit with predominantly right hand corners. 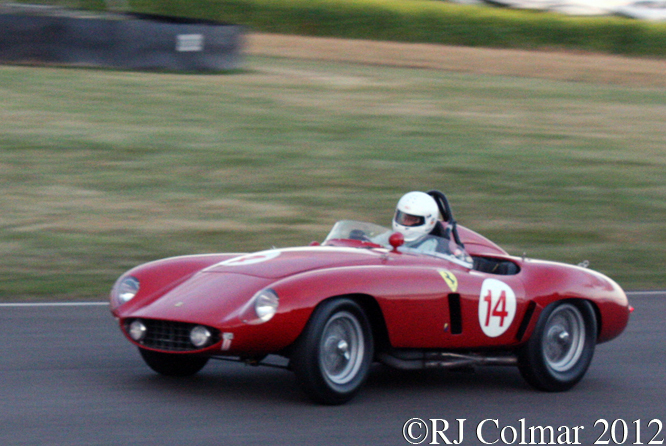 The C6R was also originally intended to be powered by a race bred 340 hp 4.5 litre / 274 cui Ferrari V12 motor of the type more commonly found in a Ferrari 375MM of the type he had run at Le Mans in 1954 for Phil Walters and John Fitch. 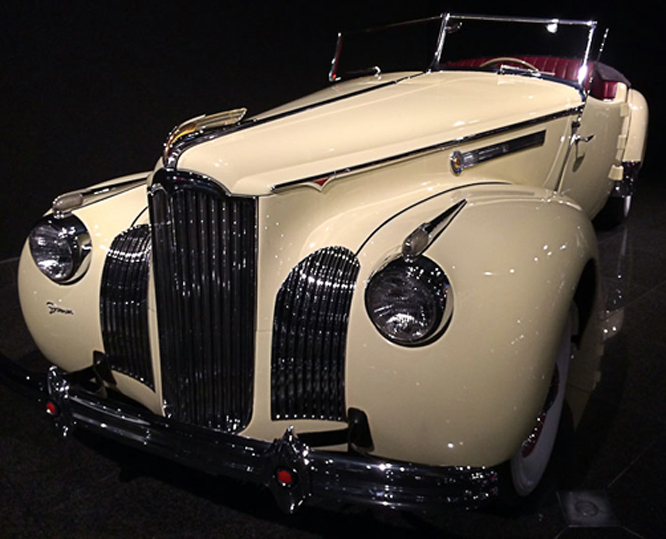 Responsibility of the design for the body of the C6R was handed over Herbert “Bud” Unger who had worked on the bodies of the Cunningham C4R and C5R Cunningham’s as a metal worker. 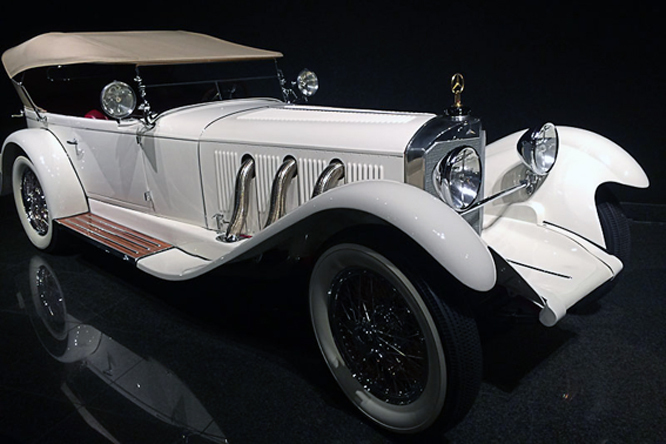 In correspondence with me, about the design, Mr Unger said; “The engineers wanted maximum air flow to the brakes front and rear…” These were 13 inch air cooled drum brakes, prone to fading when hot. 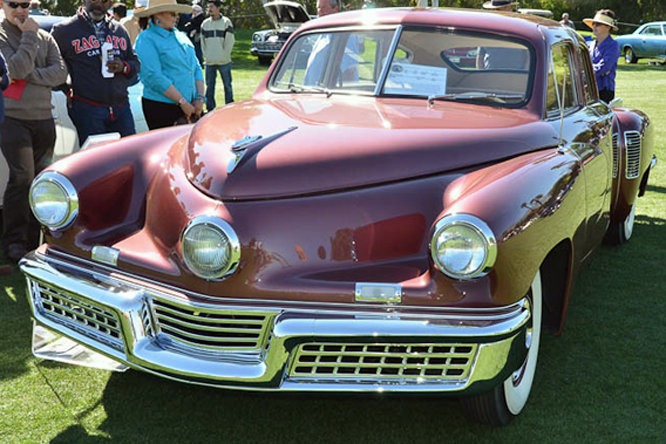 “I made the front air intake as large as possible and also extra air intakes on both sides beside the main grille air intake. 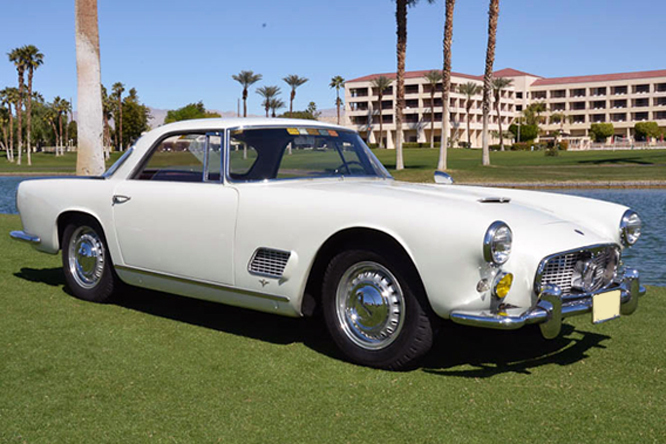 By the time the car appeared at Sebring in 1956 with it’s unpainted aluminium body, crafted by “a man form Europe that was an expert with the (English) wheel. 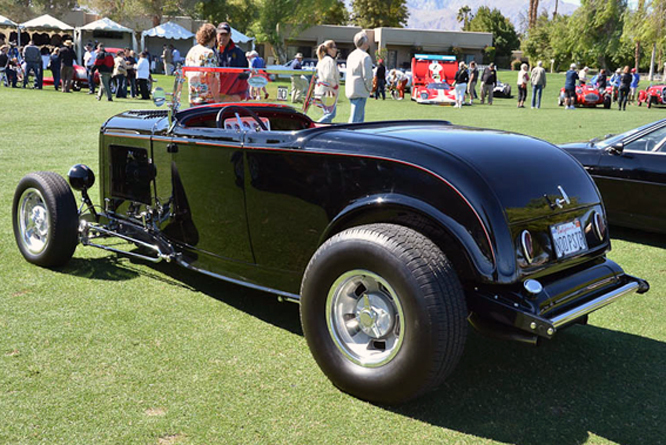 Briggs, for reasons unknown, compromised the original design criteria by fitting a modified 3 litre Indy 500 engine running on petrol instead of the usual alcohol brew. Le Patron shared the driving at Sebring with John Gordon Bennett and they retired from the race on the 54th lap after the clutch disintegrated. 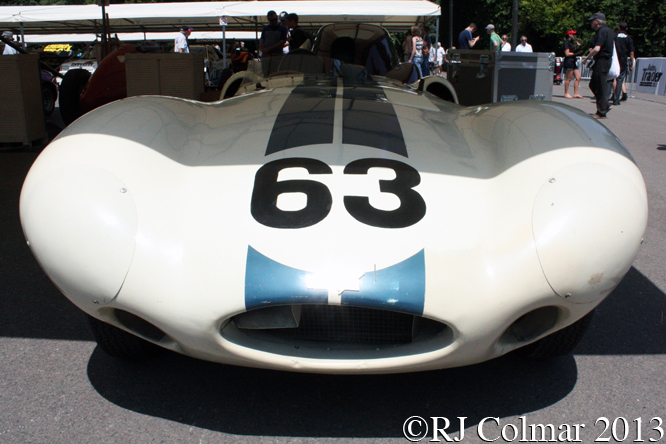 When the C6R appeared at Le Mans the body had some alterations including a single smaller front intake and a D-Type Jaguar like headrest and rear fin and the car ran over the weekend with the rear brake cooling intakes in open and blanked off configurations. During the course of it’s second race Briggs and Sherwood Johnson found the C6R started loosing gears and it retired from 13th place after 18 hours after the engine had enough of pushing the car round in forth, top, gear only. 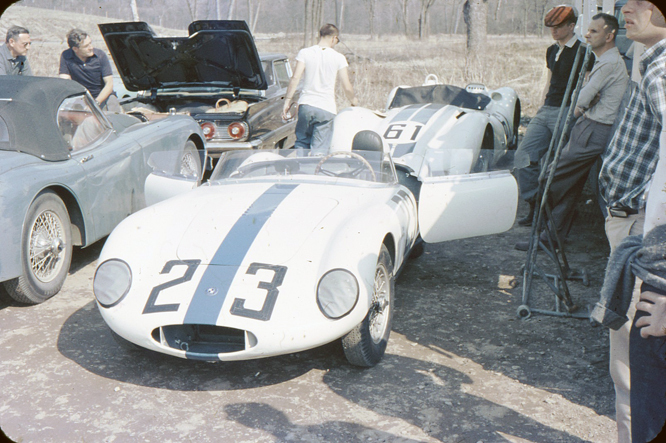 Briggs Cunningham raced the car one more time in 1955 at Road America where the Offy motor again expired for good. 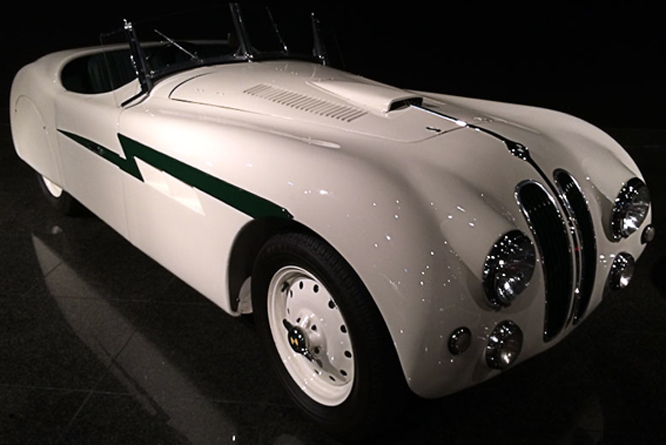 The car did not run again until 1957 by which time a 3.8 litre 6 cylinder Jaguar six cylinder motor had been fitted. 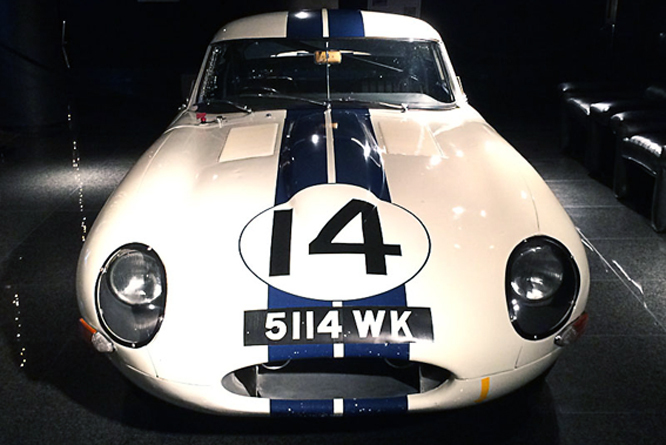 Briggs raced the car on four occasions with a best known result of 9th at Lime Rock in June 1957. 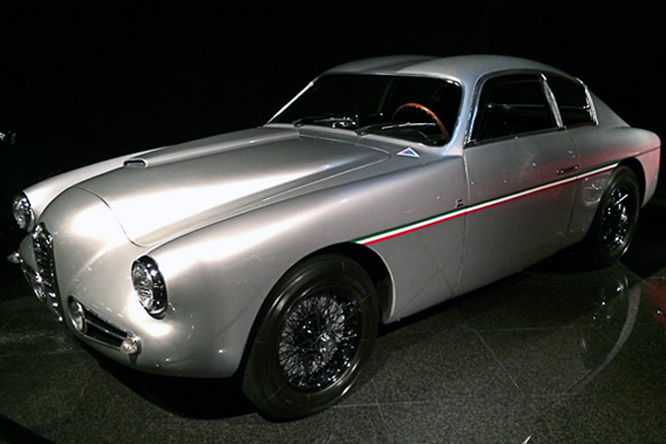 The car was permanently retired to Briggs Cunningham’s collection thereafter which has since become part of the Collier Collection. 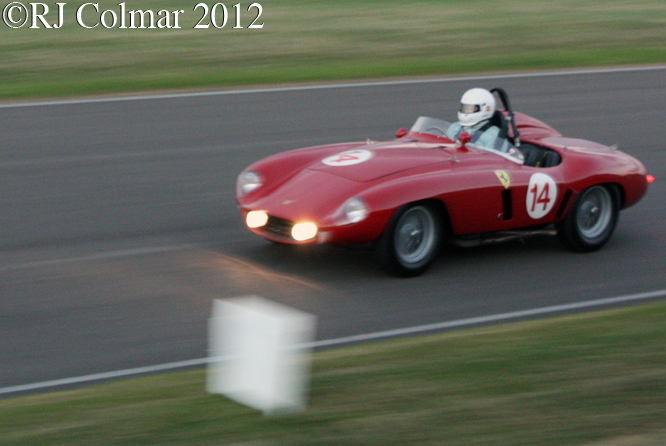 It is seen here at recent Goodwood Festival of Speed meetings. My thanks to Mr Unger, Cunningham Motorsport Historian Lawrence W. Berman, Paul Kierstein from the photo archive and Sondre Kvipt in Norway who facilitated my correspondence with Mr Unger. 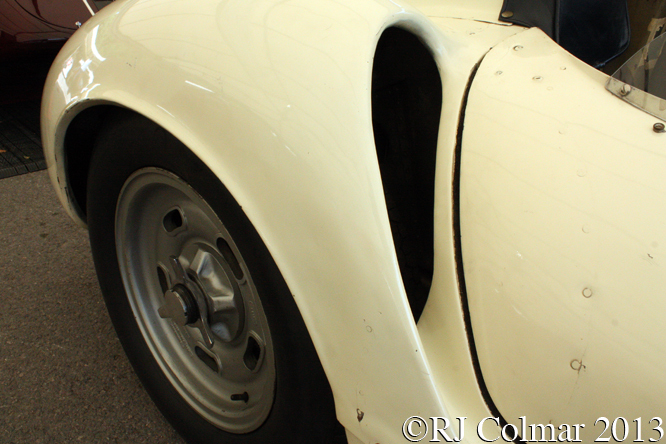 Thanks also to Herbert at The Nostalgia Forum who brought up the subject of the C6R’s blanked off rear air intakes. 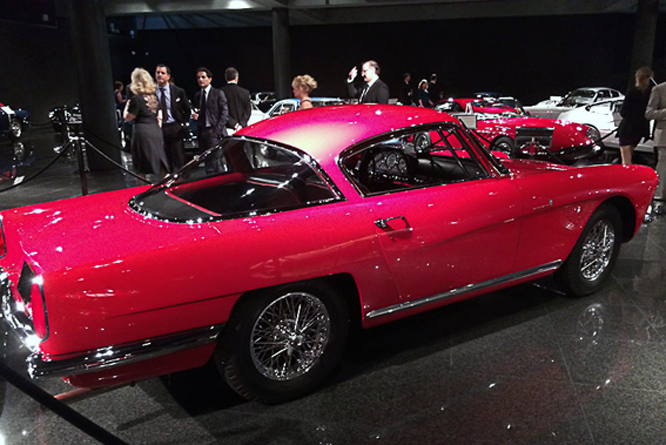 Thanks for joining me on this “Smaller, Lighter, RHD” edition of “Gettin’ A L’il Psycho On Tyres” I hope you will join me for Ferrari Friday tomorrow. Don’t forget to come back now ! 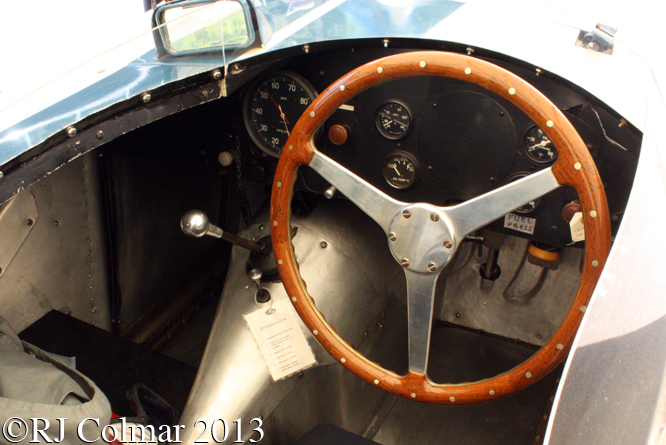 This entry was posted in Uncategorized and tagged Bennet, Berman, C6R, Collier Collection, Colmar, Cunningham, Festival of Speed, GLAPOT, Goodwood, Herbert, Jaguar, Johnson, Kierstein, Kvipt, Motorsport, Offenhauser, Ralph, Unger on June 5, 2014 by Ralph. 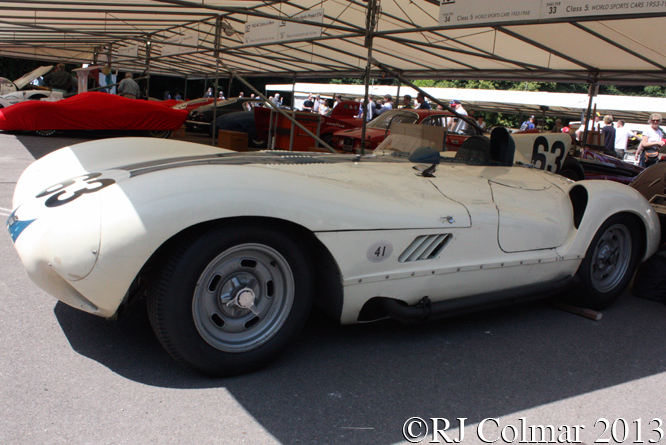 Today’s featured Ferrari 750 Monza chassis #0504M was purchased new in 1955 by S.A.I.P.A. Srl in Modena Italy in February 1955 and nine days latter it was rented out to Frenchman Michel Poberejsky who entered and won the Agadir Grand Prix for sport cars entered under the pseudonym “Mike Sparken”. 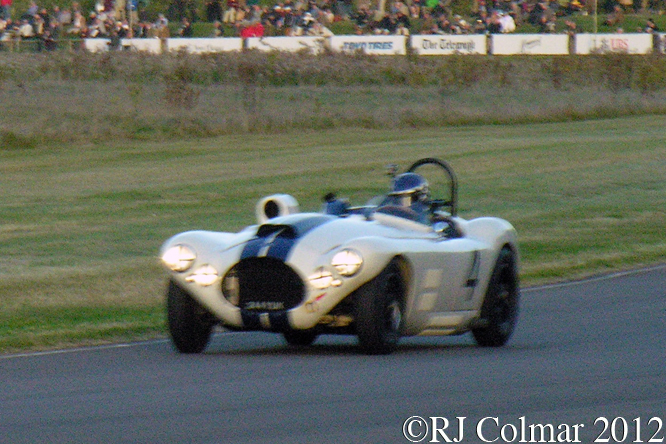 After retiring, having started from pole, from the 1955 British Empire Trophy and then coming second, from pole again in the Easter meeting at Goodwood, Sparken was joined by Marsten Gregory at Le Mans where the pair retired with engine problems. Marsten Gregory then drove #0504M in two races in Portugal and one in Brazil scoring 2 2nd plce finished and a win at the Portuguese Monsanto track. 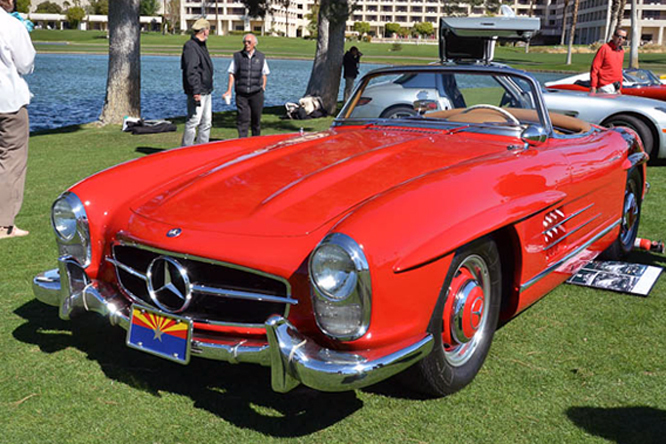 The last known races for the car were in the United States with Donald Johnson driving to a 3rd and 2nd place finishes at Lawrenceville and Greenwood in 1963, Donaldson is credited with a final race appearance in 1964 at Mid America Raceway where he is believed to have started but his finishing result is unknown. 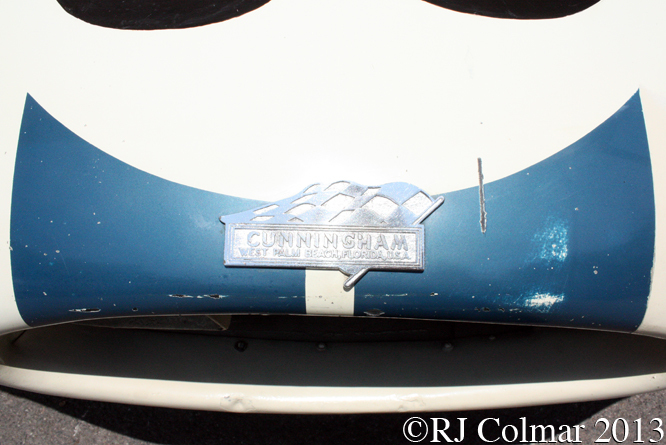 Dudley Cunningham drove the car in the 1969 Mt Equinox Vintage hillclimb where he set a record time. 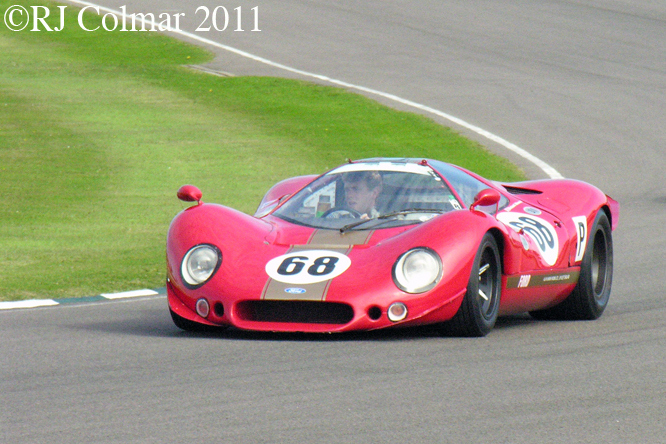 In 1970’s the car returned to Europe and has been with its current owner Richard Frankel since 2000, #0504M is seen in these photographs competing in the Freddie March Memorial Trophy at the Goodwood Revival meeting last year where it’s owner retired with less than half an hour to go. Thanks for joining me on this “Ferrari For Hire” edition of ‘Gettin’ a li’l psycho on tyres’, I hope you will join me again tomorrow. Don’t forget to come back now ! 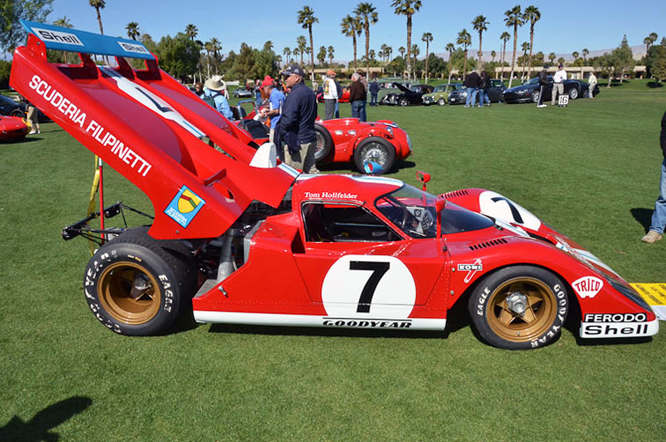 This entry was posted in Uncategorized and tagged 750, Agadir, Car, Colmar, Cunningham, Donaldson, Ferrari, Frankel, GALPOT, Goodwood, Greenwood, Gregory, Johnson, Lawrenceville, Le Mans, Mid America Raceway, Monsanto, Monza, Mt Equinox, Oulton Park, Poberejsky, Racing, Ralph, Revival, SAIPA, Scaglietti Spider S1, Sparken, Sports on April 5, 2013 by Ralph. After four all to brief hours sleep I woke up at 4:30 am on Friday and got togged up in swinging sixtyish accessorized fancy dress which included button collard shirt, period scarf, flat hat and a pair of round blue shades. 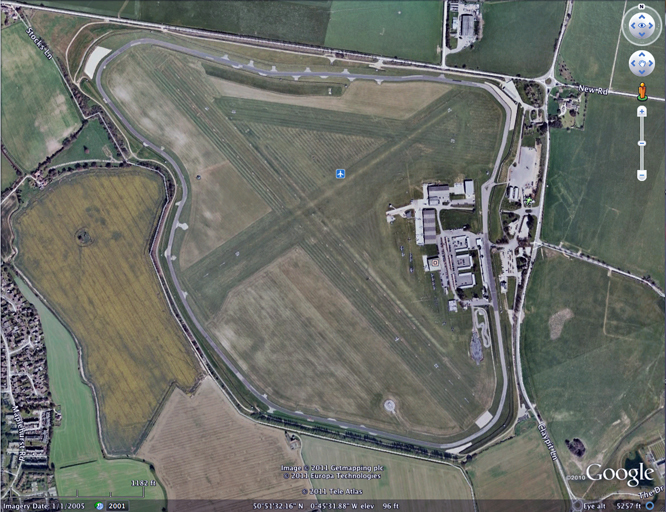 By 5.30 am I was headed back towards Lord Marches renowned Goodwood estate, this time to visit his private race track which I had not seen since in 1987. Back then I was visiting to take part in a track day, the circuit had not been used for racing since 1966 and the facilities were in a sad state of disrepair. 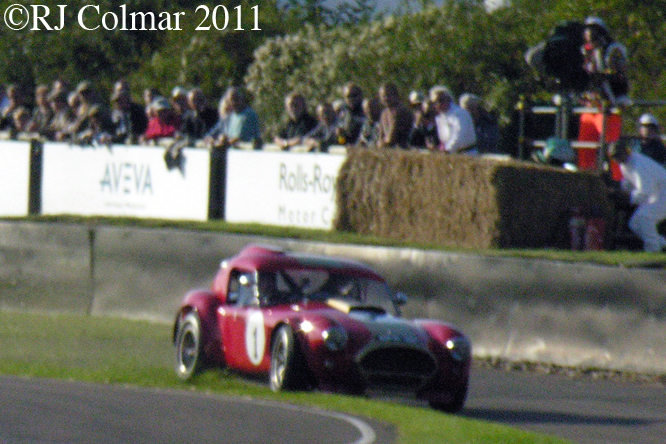 Five years after the runaway success of the inaugural 1993 Goodwood Festival of Speed, held on a special hill climb track round the main buildings of his estate, Lord March decided to revive events on his racing circuit with an event dedicated to vehicles that raced in the Circuits halcyon days from 1948 to 1966. The Revival has become a huge fancy dress party covering possibly the most optimistic two decades the Western World has ever known. More on the fancy dress side of the Revival will follow with a special blog on Saturday. 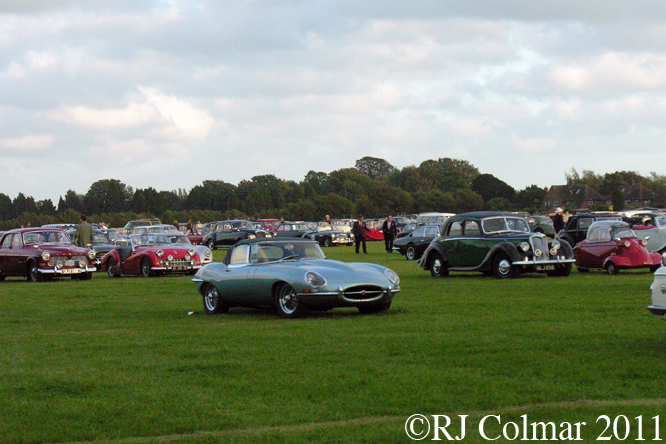 Like the Festival of Speed the Goodwood Revival has also become a runaway success both racing days this year were completely sold out. 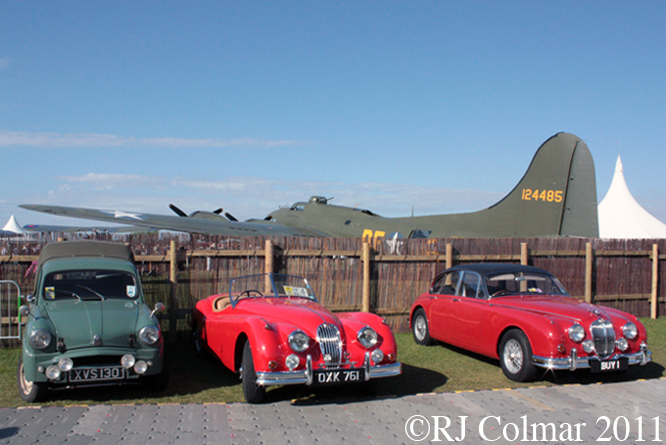 Seen here a Standard 6CWT Pickup, XK140 and a Mk2 Jaguar. 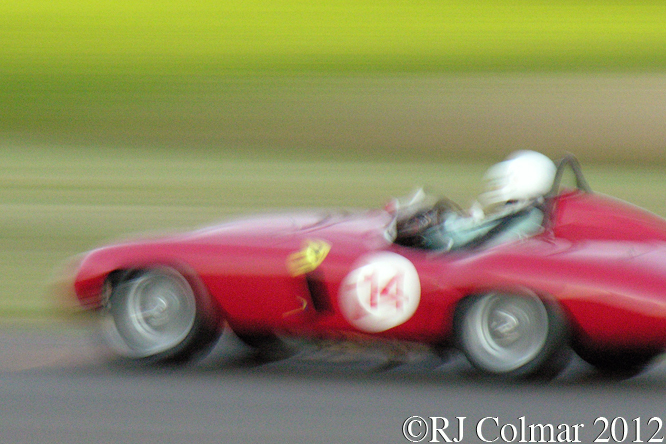 I got to the track in plenty of time to catch all the practice sesions which were held on the Friday, but I had not counted on spending well over an hour dribbling around the car park reserved for those spectators arriving in classic cars ! 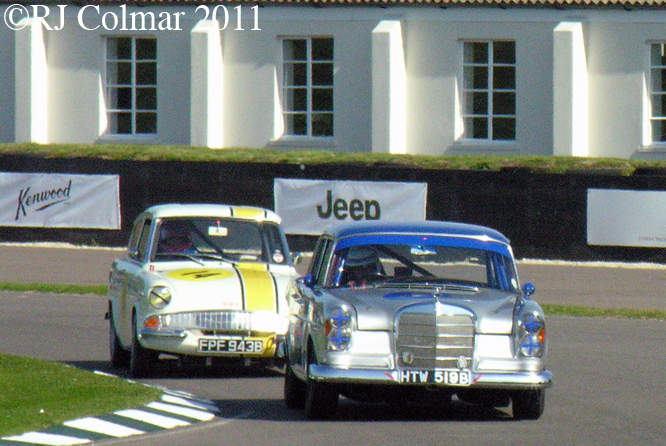 The first action I caught on track came courtesy of the touring cars, here Brian Redman in his Mercedes Benz 300SE leads another former Grand Prix driver and, in my humble opinion, one of the better former Top Gear presenters, Tiff Needell driving a Ford Anglia through Woodcote. 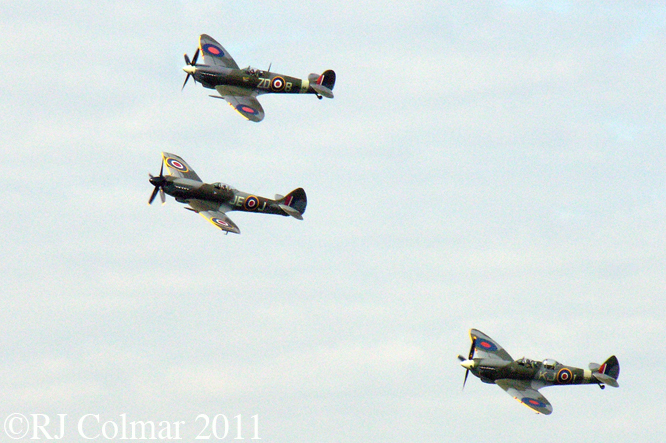 Organisers hoped to gather 15 Supermarine Spitfires at last weekends event here a Mk5, short wing 5 blade screw Mk 15 and two seater Mk9 fly past these awesome machines are powered by 24 litre / 1465 cui Rolls Royce Merlin motors. 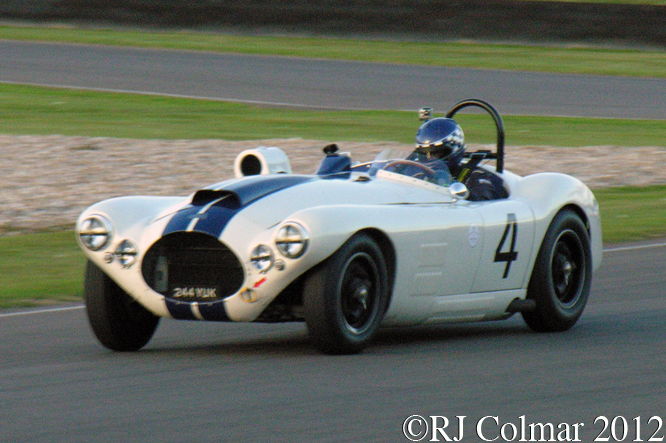 Ford of Britain celebrated it’s centenary with a stupendous collection of passenger, military and commercial vehicles, none quite as breathtaking as the Ford 3 litre / 183 cui formula 1 DFV powered Ford P68 /F3L designed by Len Bailey and built by Alan Mann Racing. Jim Clark was to have driven this car on it’s debut at Brands Hatch but because of conflicting tyre contracts Jim ended up racing a Formula 2 car at Hockenheim with fatal consequences. Surprise car of the meeting that I had never heard of before is the #23 Marina Special powered by Rolls Royce V8 driven by Mark Ashworth, turns out this car was built by Alan MacDonald at the Beagle Aircraft Hanger in Shoreham for Alan Mann who would later be responsible for the Ford P68. 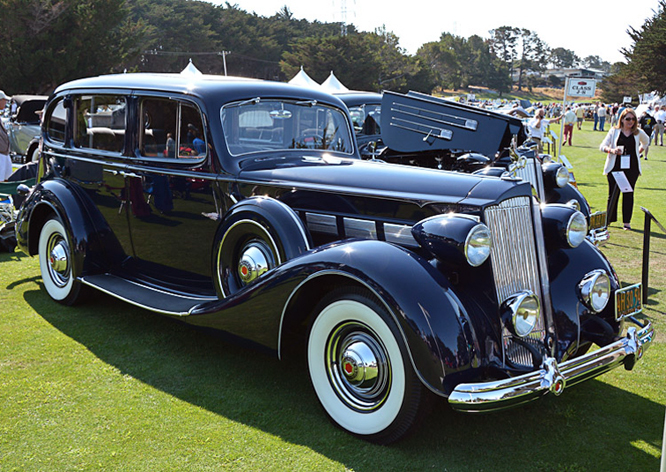 Rolls Royce were not in the least impressed with the Marina RR and the car appears to have been exiled in Belgium for fear that it might be impounded. Ueber Formula One aerodynamicist Adrian Newey has an important day job at with reigning Formula One Champions Red Bull Racing, during this rare weekend off he teamed up to drive the #25 E-type Jagaur with 10 time Grand Prix winner Gerhard Berger. Some interesting tweaks to the boot lid helped the pair stick this car on pole over 2 seconds clear of the rest of the field for Saturdays Fordwater Trophy Race. 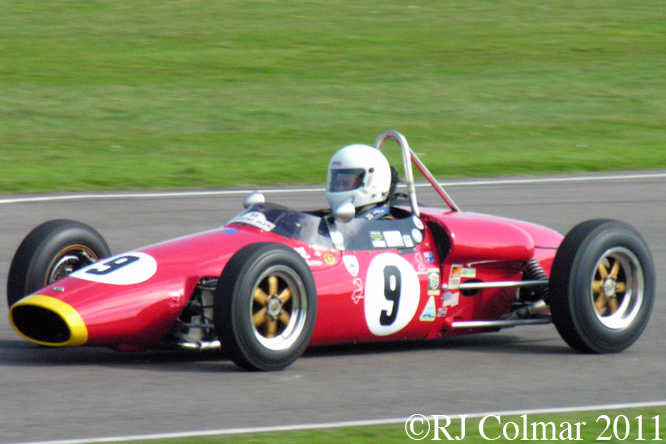 I had never seen or heard a screaming formula Junior car before Friday and their 1100 cc / 67 cui 4 cylinder motors scream enough to make your eyes water. 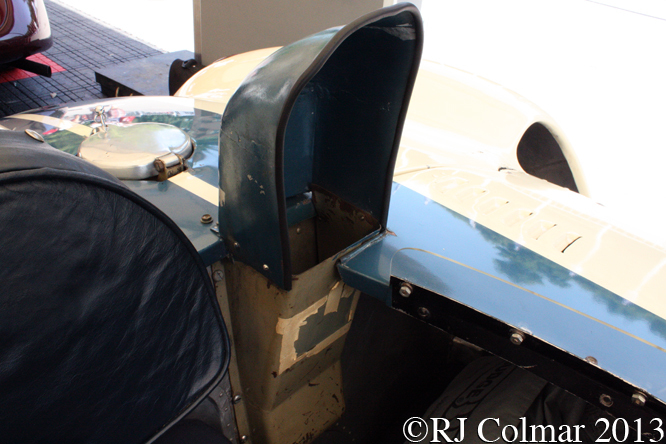 The #9 Elfin Ford above of Bill Hemming was one of two Antipodean designed and built Formula Junior cars entered in the Chichester Cup. 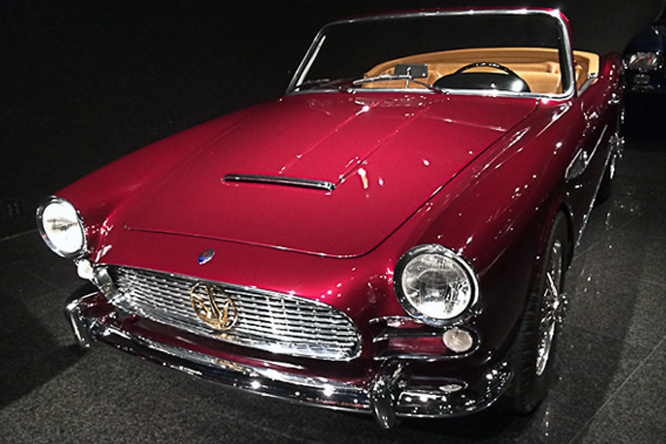 Among the many features was a display of cars driven by the first five time world champion Juan Manuel Fangio. 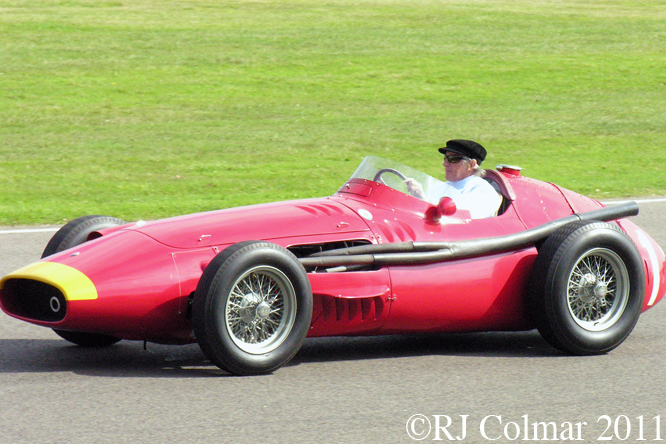 The #1 Maserati 250 F seen above was driven by Fangio to his last and perhaps the most masterful Grand Prix victory of all time at the Nurburging in 1957, after a botched pit stop Fangio made up over 50 seconds on two Ferrari’s over taking them on the penultimate lap and holding on to win by three seconds. Seen at the wheel of a 250F for the first time in his trade mark hat is Sir Jackie Stewart, who by his own admission also drove his finest race at the Nurburgring winning a wet and foggy 1968 German Grand Prix by four minutes despite driving round the torturous 14 mile track with a broken wrist ! 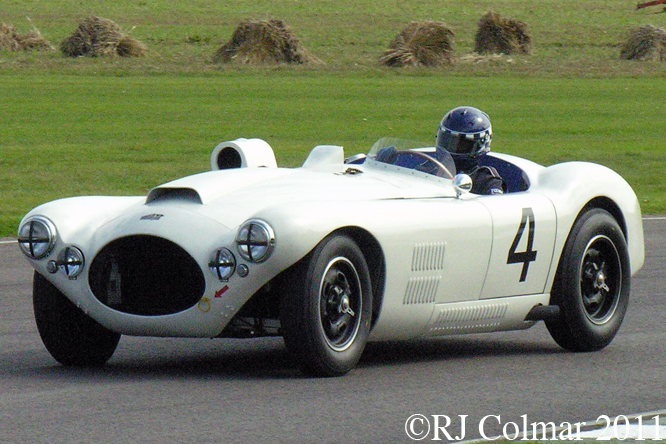 Among many evocative vehicles of US origin at Goodwood was this 1953 Chrsyler Hemi powered Cunningham C4R replica roadster, initially designed to compete at Le Mans, driven by Ben Shuckburgh during practice for the in the Freddie March Memorial Race. 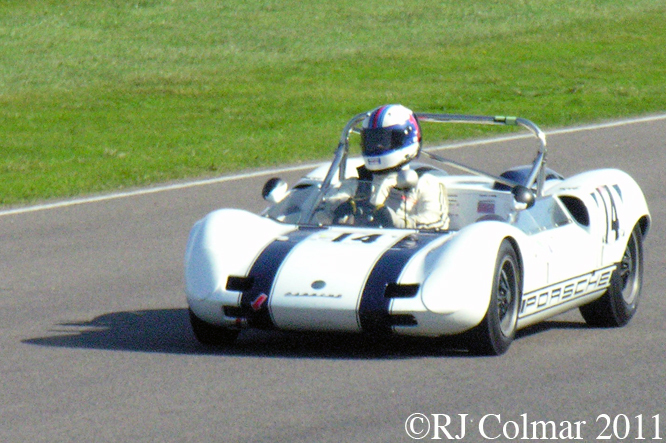 The Madgwick Cup for under 3 litre / 183 cui sports cars built between 1960 and 1966 featured this rare Elva Porsche Mk 7P driven by Helmut Ries. 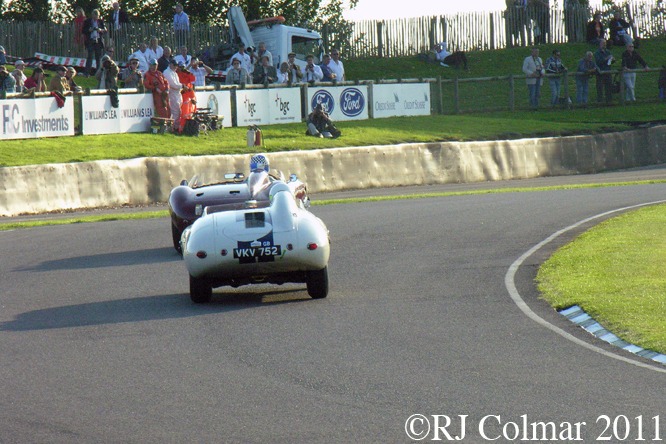 Most Elva’s entered for the Madgwick Cup were BMW powered. 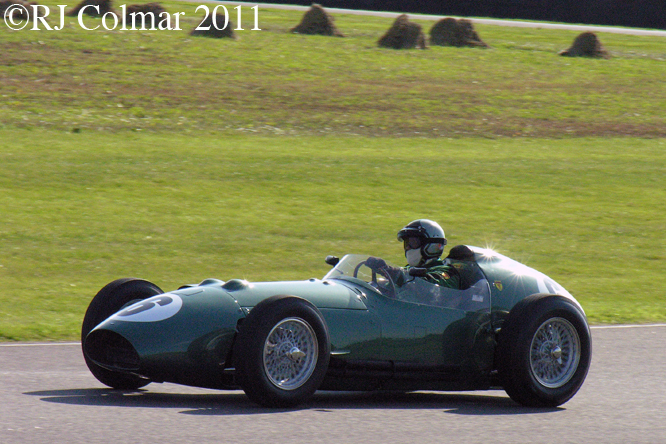 The Richmond Trophy of the last front engined Grand Prix Cars had a fittingly international entry of vehicles, Hubert Fabri is seen here at the wheel of his Aston Martin DBR4. 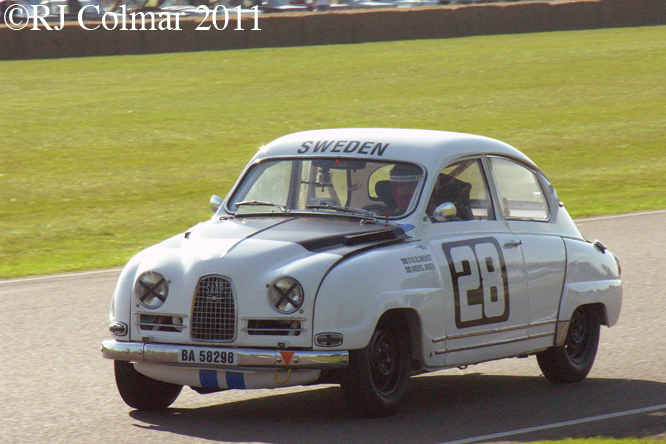 The one and only Stig Blomquvist, 1984 World Rally Champion, mercifully no relation to the poor imitation on Top Gear, shared the 2 stroke #28 1963 Saab 96 Sport with Anders Jensen seen here at the wheel during the second touring car practice for the St Mary’s Trophy. 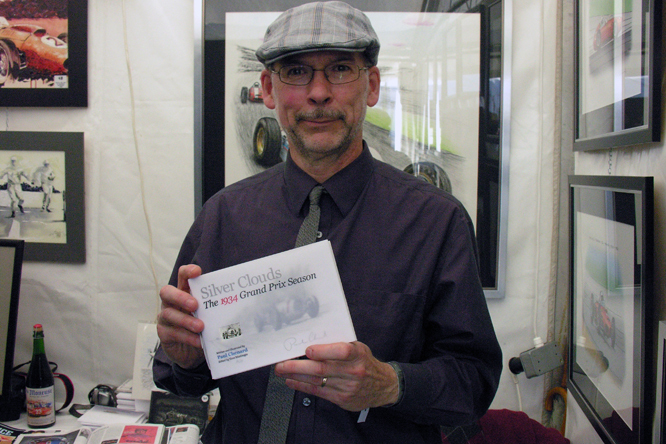 I made time to take a break from the on track action to catch fellow blogger artist Paul Chenard who came all the way from Nova Scotia to promote his latest publication the illustrated story of the 1934 Grand Prix season “Silver Clouds”. 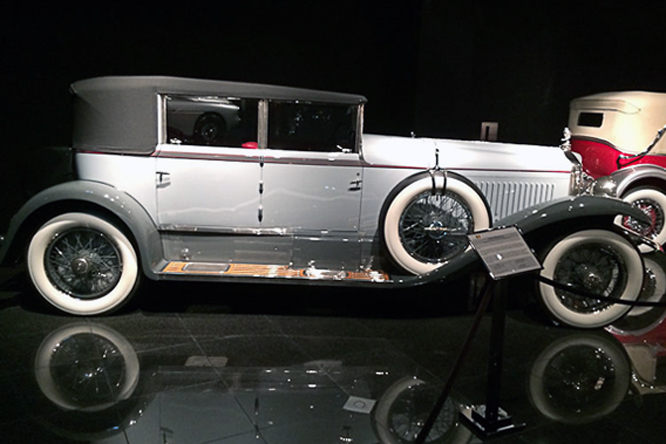 Apparently the Daimler Benz Museum were so impressed with this hand bound limited edition they have acquired two copies. Going fast, act now ! To avoid forthcoming seasonal disappointment you can contact Paul to order your copy on his blog here. 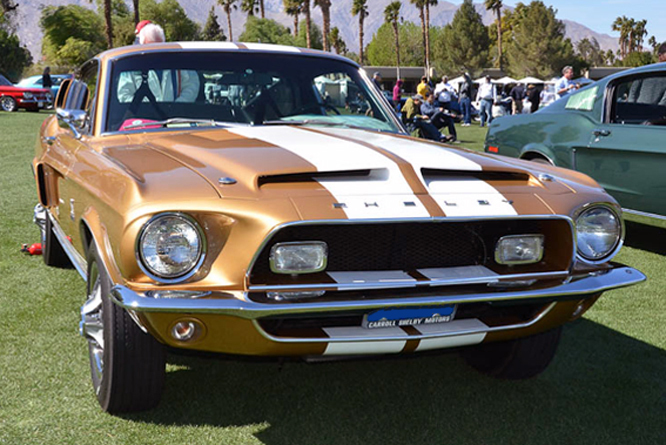 the resultant damage precluded the vehicles participation in the rest of the weekends proceedings. 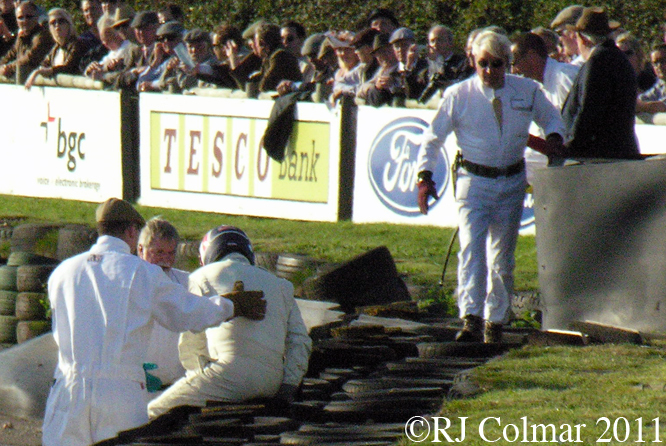 Fortunately Gerhard was not seriously injured and finished second sharing Adrian Newey’s E-type Jaguar in the Fordwater Trophy Race on the Saturday. The 1.5 litre / 91.5 cui era of Formula One goes back to the heyday of British driver participation in Grand Prix racing when Graham Hill, Jim Clark and John Surtees took three consecutive World titles from 1962 to 1964 and Jim Clark won his second title in 1965. 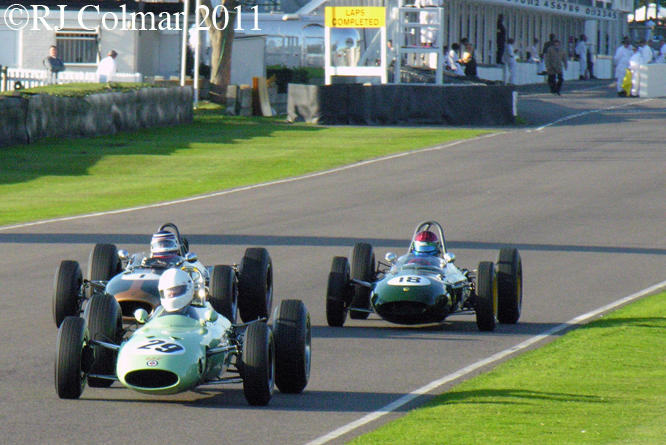 Above Kurt DelBene in the 1964 #29 BRP-BRM, Roy Walzer the 1964 #1 Brabham Climax BT11 and Paul Drayson in the 1962 #18 Lotus BRM during qualifying for the Glover Trophy. This era of cars were immortalised in the film Grand Prix, though many of the chassis used in the film are actually cheaper Formula Juniors. For romantic dreamers like myself there is a sad tale to relate to the prototype E2A ‘VKV 752’ seen here being driven by Tony Dron. 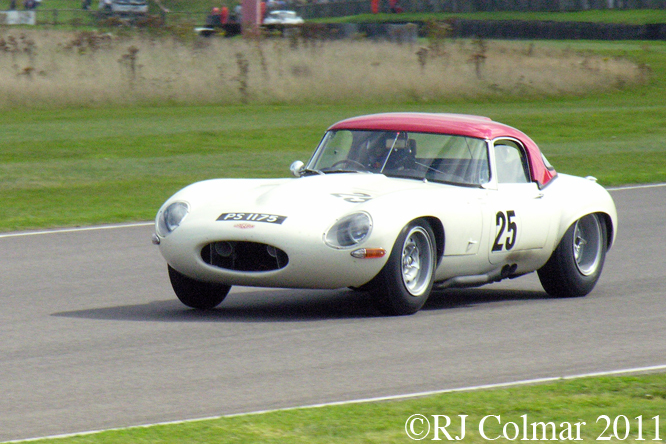 This was the second of two E type Jaguar prototypes featuring components including the independent rear suspension that would be carried over into the production ‘E-Type’ model. 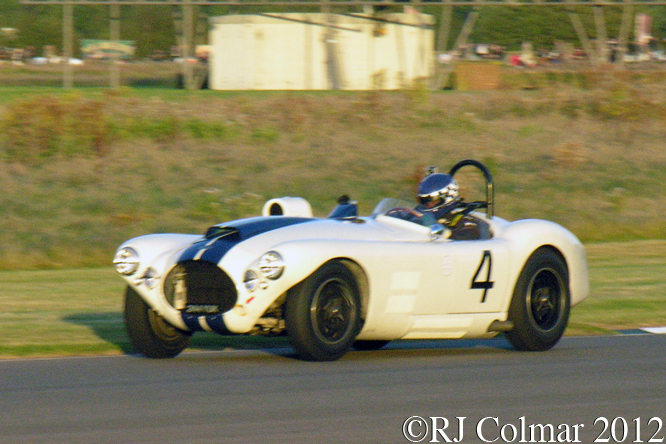 E2A was driven at Le Mans by Hangsen & Gurney without success in 1960 and used by the Cunningham team in the USA with Sir Jack Brabham and Bruce McLaren amongst others at the wheel scoring a single minor victory against weak opposition. 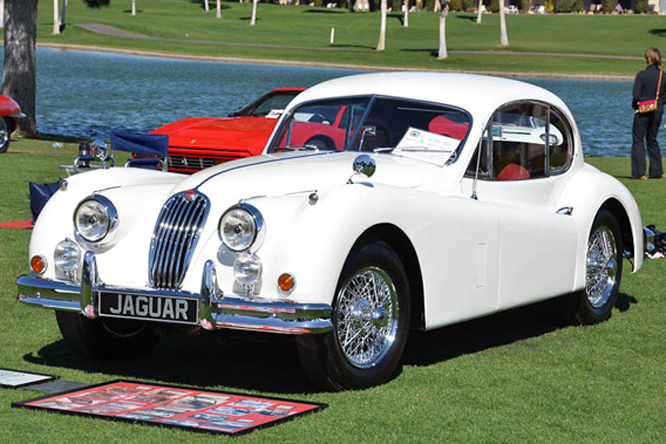 In 1961 Jaguar used E2A as a test mule back in England. 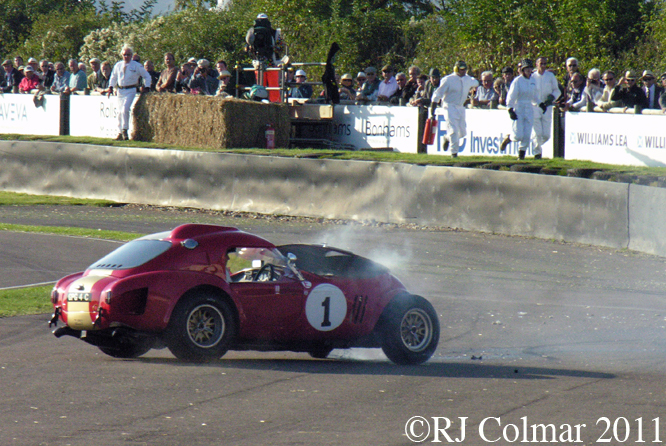 Roger Woodley Jaguar’s customer competition manager at the time was allowed to save E2A from the scrap heap on condition that the car would not be raced again. 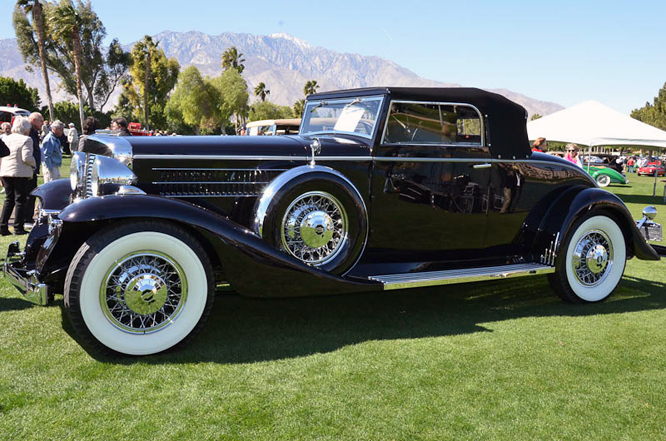 Sadly the first thing new owner Stefan Ziegler did after acquiring E2A for US$4,957,000 was turn E2A into a weapons grade racer and disregard Jaguars request that the car not be raced again. Seems rather pointless when any number of weapons grade ‘D-types’ can be acquired for a fraction of the cost of E2A. More on the ‘to race or not to race E2A’ argument can be seen on this Nostalgia Forum thread. After the qualifying sessions were over it was time to head back through the spectators Classic Car Park, I could have stayed longer but it was getting to the dark end of an already long day. 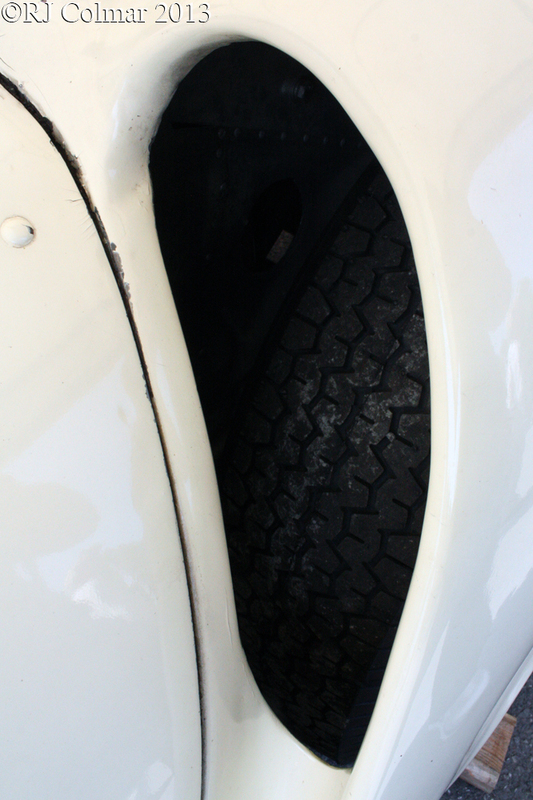 Thanks for joining me on this Goodwood Revival edition of ‘Gettin’ a lil’ psycho on tyres’, I will continue to bring you more stories from Goodwood all week, I hope you will join me again for the first anniversary edition of ‘Gettin a lil’ psycho on tyres’ tomorrow. Don’t forget to come back now ! 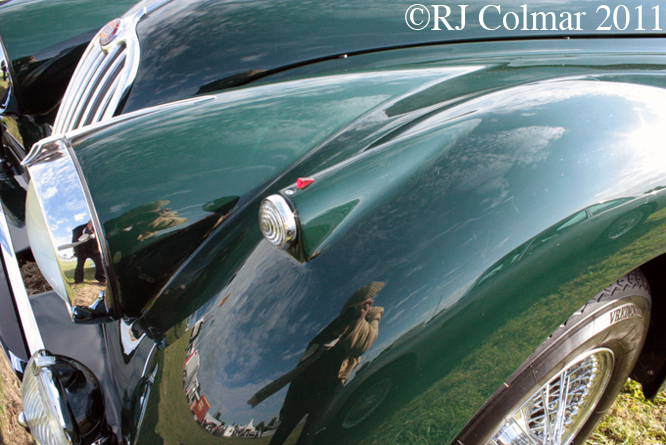 This entry was posted in Uncategorized and tagged Art, Aston, BRP, Cobra, Cunningham, Elfin, Elva, Ford, GALPOT, Goodwood, Jaguar, Marina, maserati, Mercedes, Revival, Spitfire, Standard, Tidesco on September 19, 2011 by psychoontyres. 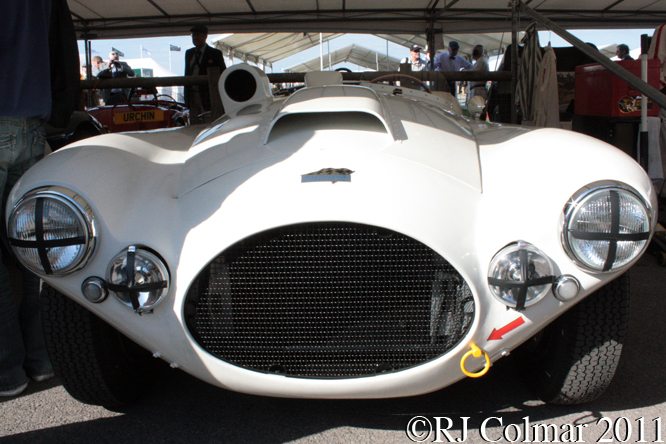 Today we return to Lime Rock in 1959 courtesy of Ed Arnaudin for a look at this OSCA Tipo S-187 belonging to Briggs Cunningham. Officine Specializzate Costruzioni Automobili – Fratelli Maserati SpA was set up by the three racing mad Maserati brothers Ernesto, Ettore and Bindo after their involvement with the company bearing their own name had concluded with it’s sale to Adolfo Orsi in 1937 and the expiry of their subsequent 10 year consulting contracts in 1947. 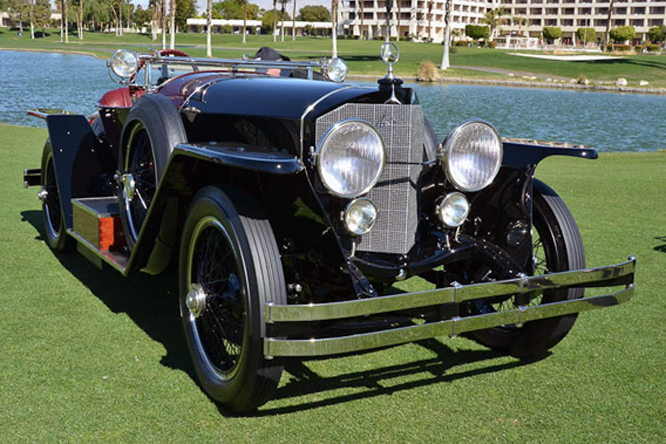 The brothers focused on building extremely successful sports cars primarily with engines of 750 cc / 45 cui to 1500 cc / 91.5 cui. 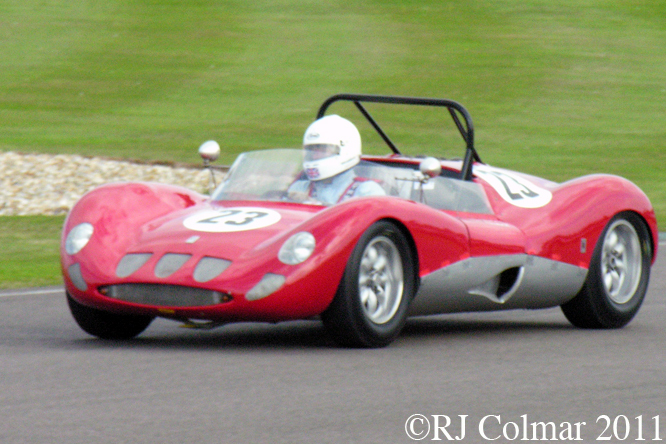 Cunningham’s car seen here appears to be one of 17 Tipo S-187’s built from 1956 – 1960 with a 70 hp 749 cc / 45 cui twin cam engine with a, for the time, high 9:1 compression ratio. 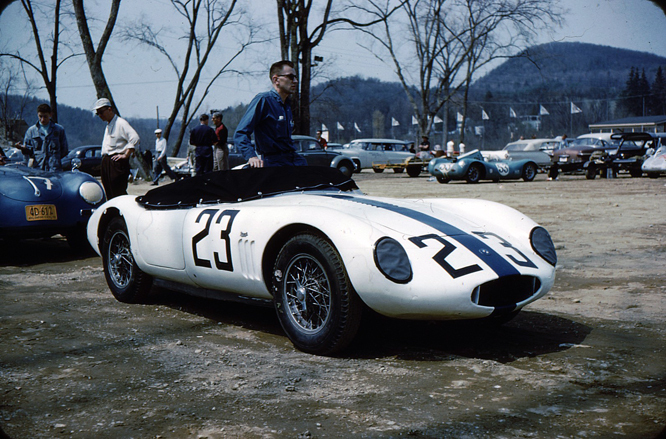 The real story behind the #23 OSCA on this day in 1959 however is the driver who took the car to victory lane, one D McCluggage from Kansas, who is well known for breaking down discriminating and prejudicial barriers in journalism and at the race track, simply D stands for Denise. As well as regularly whooping all the boys on the race track she is a seasoned motor sports journalist who was famously sent to Indianapolis by The Herald Tribune only to find she was barred from the press box, pit lane AND garage area, unperturbed she got her story from elsewhere round the track and published anyway. All Denise wanted to do was win and she did often, after her career as a professional driver was over she became a founding light at AutoWeek where her accomplishments are still scene as an example for others to follow. 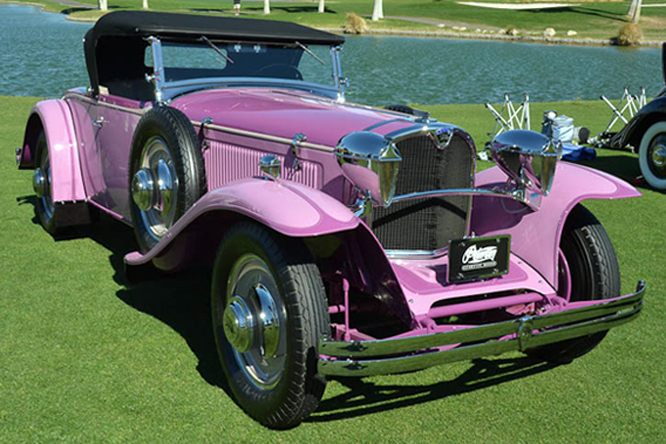 Denise recently became the only Journalist to ever be inducted into the Automotive Hall of fame and at over 70 she still writes her ‘Drive, She Said’ column syndicated in over 90 newspapers across the US and Canada. Hat’s off to Denise gentleman, for waking us up to our equals ! Thanks to Steve and Ed Arnaudin for the photograph, and to Terry O’Neil for the race day information. Hope you have enjoyed today’s prejudice free edition of ‘Gettin’ a lil’ psycho on tyres’ and that you’ll join me tomorrow for a look at a splendid vintage Triumph Dolomite. Don’t forget to come back now ! 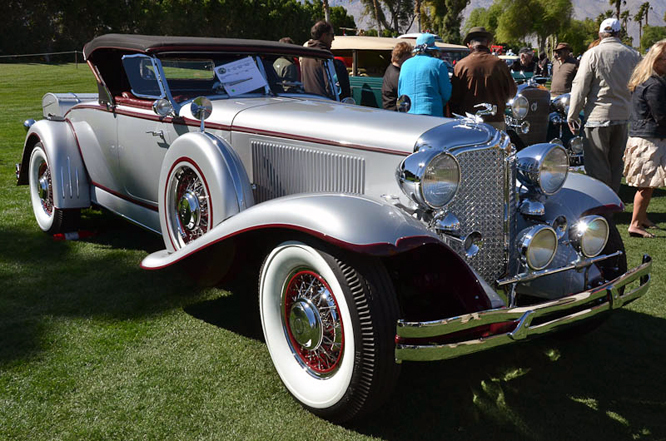 This entry was posted in Uncategorized and tagged Arnaudin, Art, Cunningham, Denise, Ed, Hill, maserati, McCluggage, OSCA, Phil, Psycho, S-187, Tidesco, Tyres on January 15, 2011 by psychoontyres.